15. They Shoot Horses Don’t They? It is 30 years since Racing Cars unique blend of rock and funk first found favour with the UK’s gig goers and this DVD was filmed at their 30th Anniversary Concert to a packed house at Pontardawe Arts Centre, Wales on 7th July 2006. Racing Cars have plenty of laps left in them and as this DVD shows they remain one of the great British bands. – CHRIS THOMAS- bass and vocals, – COLIN GRIFFIN- drums. Always a great live band, the band packed out this 30th anniversary show and offer a timely reminder of both the strength and weaknesses of a classy live outfit who topped the charts almost in spite of themselves...Complete with crowd and band interviews and a musical prequel from an excellent male voice choir, this is almost as much a celebration of Welshness as the band itself. 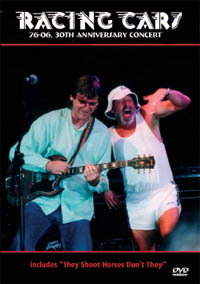 This DVD captures their 30th anniversary concert at Pontardawe Arts Centre in July 2006, and it's a document of one of Wales' most underrated rock outfits. The 16 tracks here show a deeply impressive performance, with all five members giving a hometown audience their all.